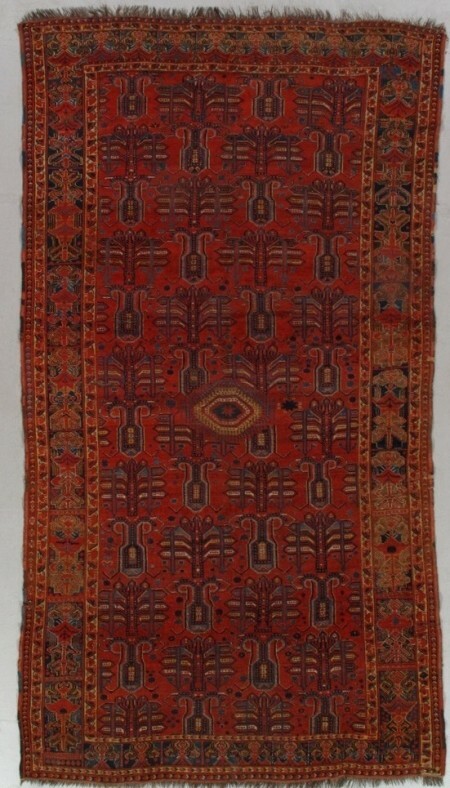 This is an extremely rare nomadic pictorial rug from the Maizidi subtribe of one of the Khamseh Confederation in Fars, southwest Persia. 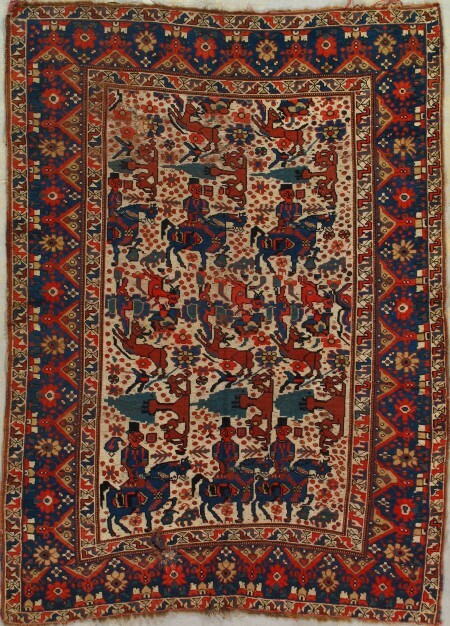 Two rows of three horsemen alternate with rows of gazelles or deer. Cypress trees are placed at right angles to the hunting action. The medium blue border with a rosette and triangle pattern is diagnostic of a Maizidi source.The horsemen are patterned on Qajar noblemen of the 19th century and although their poses are relatively static, they are presumably intended to be hunters. 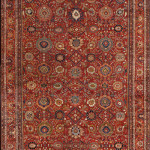 Pictorial nomadic rugs from any source are particularly uncommon and only a few other Khamseh examples are known. 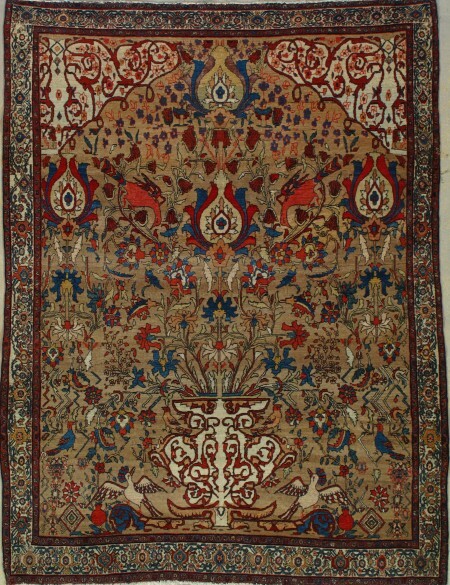 All have ivory grounds and are in the approximately 4’by 6′ format. 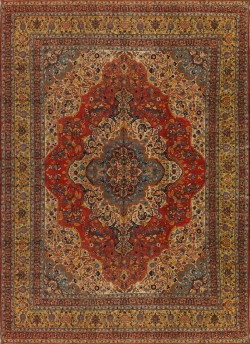 The weavers did not copy a realistic picture directly, but there were several intermediate pictorial layers: other rugs, textiles, paintings, or just memories of local events. 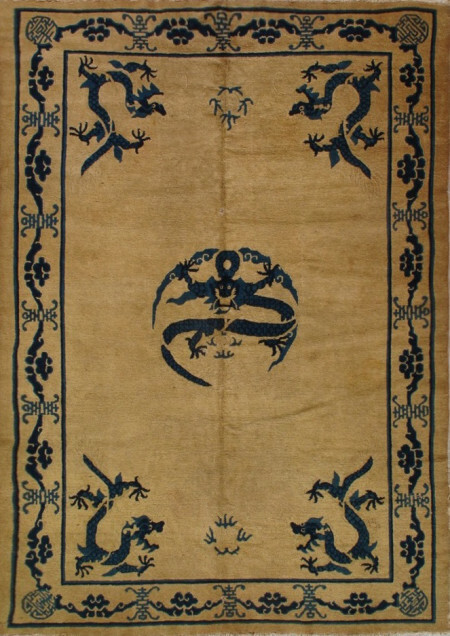 Virtually all weavings of the Fars Province tribes are at least semi-geometric and abstract with the only animate elements being chickens, peacocks, dogs or other domestic animals. 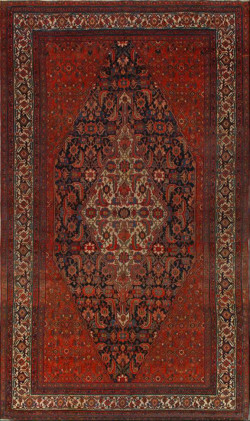 Hunting and figurative rugs such as our antique example are, therefore, only very occasionally on the market.